Ecstatic screams broke out among Korean World Cup fans Saturday night when Son Heung-min fired a projectile shoot that cut through eight defending players and flew in to the net, moments before the final whistle. South Korea lost 2-1 against Mexico, but Son’s stunning shoot and his subsequent sob of regret at losing the match became a trending topic on Twitter the next day. Mexico had scored two goals and the second half was about to come to a close, when Son dealt a breakthrough shoot, the first shoot Korea made in this World Cup. Screams of joy were heard erupting out in darkened hours at apartment complexes in Korea and at the Gwanghwamun Square in Seoul where throngs gathered to cheer together for Team Korea. 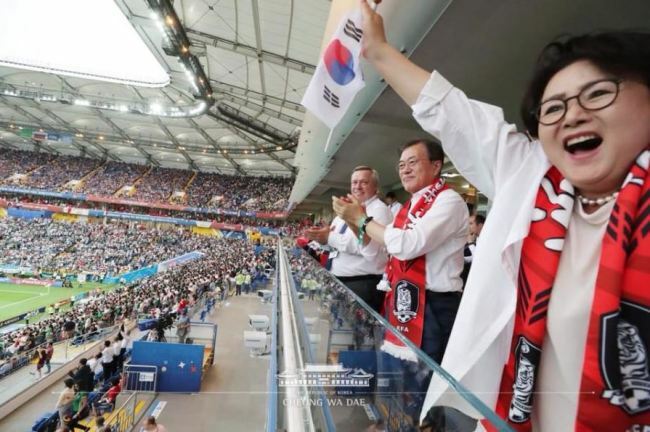 The presidential office of Cheong Wa Dae shared a picture of the look of pure delight on first lady Kim Jung-sook’s face upon seeing Son score the mid-range shoot. Kim was present at the stadium in Russia with her husband, President Moon Jae-in, who was in the country for a state visit to meet with President Vladimir Putin to discuss North Korea’s denuclearization and economic cooperation. 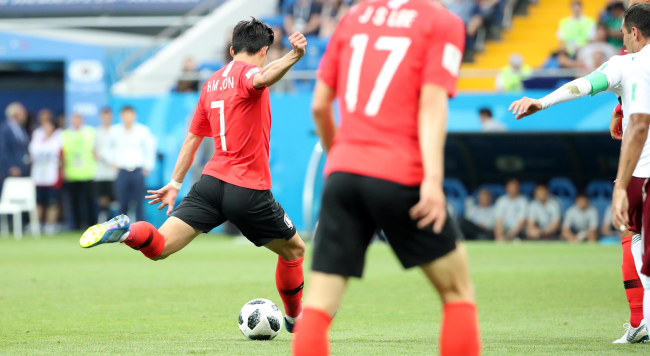 Son’s goal and his play throughout the game came off as an individual effort unsupported by his teammates among some Korean viewers. “That’s a top-class goal that Korea does not deserve,” wrote a Twitter user. “Korea hasn’t scored a goal. Son Heung-min has,” wrote another. “If I have a child I’ll name him or her Son Heung-min. If I marry a Kim, the child would be Kim Sonheungmin. If I marry a Son, Son Sonheungmin,” wrote a smitten fan. Korea’s next game is against Germany at 11 p.m. on Wednesday. The outcome will determine whether Korea will advance to the next round.